Kolkata: Amway India, the country’s largest Direct Selling FMCG company celebrated 209th birth anniversary of Louis Braille with its 15 NGO partners for ninth consecutive year by organizing myriad initiatives. In Narendrapur, Amway organized a six-day workshop in collaboration with the Ramakrishna Mission Blind Boys’ Academy starting from 4th January 2018. The main highlight of the workshop was the creation of a magnificent piece of artwork on a huge canvass measuring 3.5 x7.8 m by the visually impaired students. The artwork was based on the theme ‘Kids Guernica for Peace’, which is a decade old initiative celebrated around the world to spread the message of peace and coexistence. The mural will be exhibited at Hiroshima, Japan on 6th August, 2018 on the occasion of Hiroshima Day. Narendrapur Ramakrishna Mission Blind Boys’ Academy is the only Blind School in the world to be participating in this celebration of world peace with this artwork showcasing world peace and coexistence. 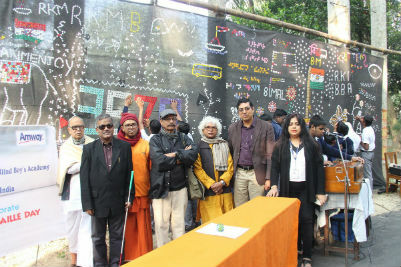 Asit Poddar, an acclaimed painter, flagged off the workshop while visually impaired students followed him by creating a huge mural using various tactile materials. The workshop also witnessed an active participation of Amway direct sellers and employees who whilst being blindfolded created different art forms on the canvas. The mural has been shared in the social media for creating awareness among people about the efficacy of visually impaired students. Chandra Chakraborty, Regional Manager, East, Amway India unveiled the Canvas in presence of dignitaries and students. Biswajit Ghosh (Principal, Ramakrishna Mission Blind Boys’ Academy), Swami Sarvapremananda (Monk in charge, Ramkrishna Mission, Blind Boys Academy), Chandra Shekhar Acharya (Eminent Artist), Asit Poddar (Eminent Artist) were also present on the occasion. The celebration of Braille Day also included an inter-school Braille Reading – Writing competition at the premises of Narendrapur Ramakrishna Mission Blind Boys’ Academy. Three schools namely Light House for the Blind, Calcutta Blind School and Narendrapur Ramakrishna Mission Blind Boys’ Academy participated in the contest. Nikita Mardi from Light House for the Blind, Rajib Das from Ramakrishna Mission Blind Boys’ Academy and Milan Adhikari from Ramakrishna Mission Blind Boys’ Academy were declared 3rd, 2nd and the winner of the competition. “I wholeheartedly thank Amway India for encouraging us to undertake this workshop where the employees and direct sellers participated enthusiastically with our students and teachers to create the mural. This engagement truly embodies the spirit of coexistence that ran as the leitmotif throughout our workshop”, commented Biswajit Ghosh, Principal, Ramakrishna Mission.